Obesity is associated with chronic diseases such as fatty liver, type 2 diabetes, cardiovascular disease, and severe metabolic syndrome. Obesity causes metabolic impairment including excessive lipid accumulation and fibrosis in the hepatic tissue as well as the increase in oxidative stress. In order to investigate the effect of mulberry leaf (Morus alba L.) extract (MLE) on obesity-induced oxidative stress, lipogenesis, and fibrosis in liver, MLE has been gavaged for 12 weeks in high-fat diet (HFD)-induced obese mice. MLE treatment significantly ameliorated LXRα-mediated lipogenesis and hepatic fibrosis markers such as α-smooth muscle actin, while MLE up-regulated lipolysis-associated markers such as lipoprotein lipase in the HFD-fed mice. Moreover, MLE normalized the activities of antioxidant enzymes including heme oxygenase-1 and glutathione peroxidase in accordance with protein levels of 4-hydroxynonenal in the HFD-fed mice. MLE has beneficial effects on obesity-related fatty liver disease by regulation of hepatic lipid metabolism, fibrosis, and antioxidant defense system. MLE supplementation might be a potential therapeutic approach for obesity-related disease including non-alcoholic fatty liver disease. Recent lifestyle changes have resulted in increases in prevalence of obesity, and obesity has become a major public health problem worldwide (Losina et al. 2012). Obesity is associated with chronic diseases such as fatty liver, type 2 diabetes, cardiovascular disease, and severe metabolic syndrome. Among these complications related to obesity, non-alcoholic fatty liver disease (NAFLD) leads to increase morbidity and mortality in obese condition. Obesity causes impairment of metabolic regulation including oxidative stress and the lipogenesis pathway, which lead to an excessive accumulation of triglycerides (TG) in hepatic tissues. NAFLD is a common chronic liver disease that includes fibrosis, steatosis, hepatocellular ballooning, and inflammation (Hey-Mogensen et al. 2012). NAFLD is a progressive disease and is characterized by the accumulation of TG in the liver (Lee et al. 2006) caused by obesity and imbalanced diets such as an excessive high-fat or calories diet (HFD). For that reason, NAFLD is accompanied with abnormal lipid metabolism with down-regulation of fatty acid β-oxidation, lipolysis, and increased lipogenesis (Enjoji et al. 2012). Therefore, management for NAFLD needs to be based on the inhibition of hepatic fat accumulation by regulation of lipogenesis and lipolysis pathways. Several genes associated with lipid metabolism play important roles in regulation of lipogenesis-associated transcription factor, liver X receptor (LXR), and its downstream genes such as sterol regulatory element-binding protein-1c (SREBP1c), fatty acid synthase (FAS), lipoprotein lipase (LPL), CCAAT/enhancer-binding protein alpha (C/EBPα), and fatty acid-binding protein (aP2) in response to oxidative stress-induced obesity (Beyea et al. 2007; Seo et al. 2004). Recently, many studies indicated the pathological mechanism in NAFLD, which may lead to over-expression of LXR. Up-regulation of LXR activated SREBP1c, and FAS is involved in fat synthesis (Enjoji et al. 2012). Furthermore, NAFLD is related to over-expression of C/EBPα and aP2, which stimulate adipocyte differentiation (Guzman et al. 2013; Pan et al. 2015). In addition, hepatic lipolysis is controlled by several genes, including peroxisome proliferator-activated receptor α (PPARα) and mitochondrial uncoupling protein 2 (UCP2), in response to lipid metabolic process and NAFLD progression (Peng et al. 2011). Furthermore, oxidative stress induced by excessive reactive oxygen species (ROS) production involves in hepatic fibrosis, inflammation, and necrosis in NAFLD (Ahmed and Ghaly 2012). The abnormal condition present in obesity causes alteration of redox homeostasis and defects of the endogenous antioxidant defense system as well. A previous study showed that dysregulation of inflammation-induced ROS activates and proliferates hepatic stellate cells (HSCs) and their collagen synthesis (Park et al. 2010). Nuclear factor erythroid 2-related factor 2 (Nrf2) is a key transcription factor involved in maintenance of cellular redox homeostasis. Nrf2-controlled genes are very important in protecting cells from oxidative stress in obesity. Previous studies demonstrated that Nrf2 inhibited onset and progression of NAFLD caused by HFD through activation of antioxidant defense system (Okada et al. 2013). Nrf2 showed the ability to regulate lipogenesis, lipolysis (Xue et al. 2013), and fibrosis (Shimozono et al. 2013) in NAFLD. In addition, Nrf2 can decrease the levels of oxidative stress by induction of defensive antioxidant enzymes such as HO-1 (Su et al. 2013) and modulate lipid metabolism and fibrosis in liver. The mulberry leaf (Morus alba L.) as a functional food is widely distributed in Asia (Ou et al. 2011). It is known to be rich in polyphenolics such as rutin, quercetin, and 1-deoxynojirimycin (DNJ). Therefore, it has been used in traditional medicine to treat several metabolic diseases including dyslipidemia (Azman et al. 2012), diabetes (Flores et al. 2012), fatty liver disease (Ou et al. 2011), and hypertension (Kobayashi et al. 2006). The mulberry leaf also enhances antioxidant enzyme activities in diabetic rats (Ha et al. 2012). However, little research focuses on the mechanism in which the mulberry leaf modulates lipogenesis, lipolysis, and fibrosis in HFD-induced obesity. This study aimed to examine whether mulberry leaf extract (MLE) could ameliorate hepatic lipogenesis, lipolysis, and fibrosis through protection of the Nrf2-dependent antioxidant defense system. Mulberry leaves (M. alba L.) were provided by the Yang Pyeong Agricultural Development & Technology Center (Yang Pyeong, South Korea). The dried leaves (1 kg) were extracted with 70 % ethanol at room temperature for 24 h. The extract was filtered and evaporated in a rotary evaporator. The water residue was then lyophilized (−80 °C, 3 days) to obtain mulberry leaf ethanol extract (MLE). Using this procedure, the yield of mulberry leaf extract (MLE) was approximately 20 %. MLE was stored at −20 °C before using. Identification of components in MLE was performed according to the previously described method (Lim et al. 2013a). Samples were analyzed by the Agilent 1100 HPLC system (Agilent Technologies Inc., Santa Clara, CA, USA), equipped with a quaternary solvent delivery system, an autosampler, and a DAD detector. Separations were carried out on a J’sphere ODS-H80 column (250 × 4.6 mm, 4 μm, YMC Co., Ltd. Japan). (1) DNJ-1 was detected at 265 nm in the gradient elution mode, using acetonitrile (A) and 0.1 % acetic acid in water (B). The elution profile was as follows: 0–15 min 50 % A in B, 15–20 min 50–80 % A in B, and 20–25 min 100 % A in B. (2) Resveratrol was analyzed at 35 °C and was detected at 310 nm in the gradient elution mode, using acetonitrile (A) and water (B). The elution profile was as follows: 0–13 min 90 % A in B, 13–14 min 78–22 % A in B, 14–17 min 60–40 % A in B, 17–17.5 min 40–60 %, and 17.5–22 min 10–90 % B in A. Concentrations of 1-DNJ and resveratrol (Sigma, St. Louis, MO, USA) as standards were prepared at 1 mg/ml where 10 μl was injected as an external standard. For quantification of standard materials, the same solvent and conditions were applied to the analytical HPLC. For each sample, three replicate assays were performed. Four-week-old C57BL/6 mice were purchased from Orient Bio (Gyeonggi-do, South Korea) and housed in three mice per cage in the room at 22 ± 1 °C temperature, 50 ± 5 % relative humidity, and a 12-h dark/light cycle. All mice consumed a commercial diet and tap water ad libitum for 1 week before their division into two groups: the normal control diet group (CON) and the high-fat diet group (HFD), respectively. All mice had ad libitum access to tap water and food either the CON diet (D12450B, 10 % kcal fat; Research Diets, New Brunswick, NJ, USA) or the high-fat diet (D12451, 45 % kcal fat; Research Diets) for following 9 weeks. After 9 weeks of dietary manipulation to induce obesity, the animals were divided into four experimental groups with six mice in each group and treated as follows: normal control diet-fed mice (CON), high-fat diet-fed control (HF), low-dose MLE (133 mg/kg)-treated high-fat diet-fed mice (L), high-dose MLE (666 mg/kg)-treated high-fat diet-fed mice (H). In our previous study, we found that low (133 mg/kg/day) and high (666 mg/kg/day) doses of MLE modulated inflammation and oxidative stress in high-fat diet-induced obese mice (Lim et al. 2013a). MLE was freshly suspended in distilled water and orally gavaged 5 times weekly for 12 weeks. Identical volumes of distilled water were given to the CON and the HF groups. During the treatment period, body weight and food intake were monitored once a week. After the experiment, the animals were anesthetized with a mixture of Zoletil50® (Virbac, Carros, France) and Rompun® (Bayer Korea, Seoul, South Korea) solution (3:1 ratio, 1 ml/kg, intraperitoneal injection). The abdomen was then opened, and blood was collected from a post-caval vein into heparin (Sigma-Aldrich, St Louis, MO, USA) coated tubes to analyze biochemical parameters. Serum was isolated by centrifugation at 500×g for 15 min and stored at −80 °C until it was used for blood biochemical experiments. The tissue samples were immediately frozen in liquid nitrogen and stored at −80 °C until they were analyzed. Experimental protocol was approved by the Institutional Animal Care and Use Committee of the Kyung Hee University (KHUASP (SE)-10-022). Plasma concentration of total cholesterol (TC), triglycerides (TG), and high-density lipoprotein cholesterol (HDL-C) were determined enzymatically using commercial kits (Bio-Clinical System, Gyeonggi-do, South Korea). Low-density lipoprotein cholesterol (LDL-C) level was calculated by total cholesterol level minus HDL-C. Plasma activities of glutamic oxaloacetic transaminase (GOT) and glutamic pyruvic transaminase (GPT) were measured using commercial kits (Bio-Clinical System, Gyeonggi-do, South Korea), according to the manufacturer’s recommendations. Plasma and hepatic activities of heme oxygenase 1 (HO-1) were measured by Heme Oxygenase-1 (HO-1) Mouse SimpleStep ELISA® (enzyme-linked immunosorbent assay) kit (Abcam 204524, Cambridge, MA, USA). Activities of glutathione peroxidase in both plasma and liver were determined by a commercial kit (Abcam 102530, Cambridge, MA, USA) using a colorimetric technique involving measurement of NADPH consumption per 1 ml after 30 min of incubation. All the assay procedures were performed according to the manufacturer’s instruction. The liver was isolated and fixed in 10 % neutral buffered formalin. The liver tissues were dehydrated and then embedded in paraffin wax. Histological sections (4 µm) of these tissues were cut and stained with hematoxylin and eosin (H&E). Liver sections were observed using an optical microscope (HS-100, OPTICAL, China). Total mRNA was isolated from the liver using Trizol reagent (Invitrogen, Carlsbad, CA, USA) according to the manufacturer’s instructions. Isolated RNA was quantified using the Nano-Drop spectrophotometer (Implen Inc., CA, USA), and cDNA was synthesized using reverse transcriptase (Takara Bio Inc., Shiga, Japan). The cDNA was amplified in a PCR reaction using Taq polymerase (Takara Bio Inc., Shiga, Japan), according to the manufacturer’s protocols. The forward and reverse primers for genes associated with lipogenesis, lipolysis, and fibrosis are given in Table 1. The PCR conditions were programmed as follows: 10 min at 94 °C, 30–35 cycles of 94 °C for 30 s, 55 °C for 30 s; 72 °C for 1 min, and 10-min incubation at 72 °C. All amplification products were stored at 4 °C before the electrophoretic step. Twenty microliters of each PCR product was added with 4 µl 6× loading buffer and was loaded onto 2 % agarose gel containing ethidium bromide. The measured mRNA levels were normalized to the glyceraldehyde-3-phosphate dehydrogenase (GAPDH) mRNA levels. The PCR results were visualized by UV and analyzed by Syngene G box (Syngene, Cambridge, UK). For the preparation of liver cytosol, liver tissues were homogenized at 4 °C in the lysis buffer containing 20 mM Tri–HCl, 150 mM NaCl, pH 7.5, 1 % NP40, 0.5 % Na-deoxycholate stock, 1 mM EDTA, 0.1 % sodium dodecyl sulfate and then centrifuged at 14,000 rpm at 4 °C for 30 min. The resulting supernatants were used for western blot analysis. Preparation of nuclear fraction was performed in the livers, frozen in liquid nitrogen, and homogenized in buffer A (0.6 % Nonidet P40, 150 mM NaCl, 10 mM HEPES (pH 7.9), 1 mM EDTA, 0.5 mM PMSF, leupeptin, pepstatin, and aprotinin). Following the homogenization procedure, samples were centrifuged 5000 rpm at 4 °C for 30 s. The supernatants were incubated for 5 min on ice and centrifuged 5000 rpm for 5 min. The nuclear pellet was suspended in buffer B (25 % Glycerol, 20 mM HEPES (pH 7.9), 420 mM NaCl, 1.2 mM MgCl2, 0.2 mM EDTA, 0.5 mM dithiothreitol (DTT), 0.5 mM PMSF, benzamidine, leupeptin, pepstatin, and aprotinin) followed by incubation on ice for 20 min. The supernatant was used to determine nuclear protein concentration. The total protein concentrations of the liver tissue extract were determined by using Nano-Drop spectrophotometer (Implen Inc., CA, USA). Protein samples were separated with SDS-PAGE and transferred onto polyvinylidene fluoride (PVDF) membranes (Millipore, Marlborough, MA, USA). The blotted membrane was blocked by incubation in 5 % defatted dry milk in PBS–Tween 20 and hybridized with primary antibodies against SREBP1c (Santa Cruz Biotechnology, Santa Cruz, CA, USA, 1:500), C/EBPα (Cell Signaling Technology, Danvers, MA, USA, 1:1000), PPARα (Abcam, Cambridge, MA, USA, 1:1000), FAS (Santa Cruz Biotechnology, Santa Cruz, CA, USA, 1:500), LPL (Santa Cruz Biotechnology, Santa Cruz, CA, USA, 1:500), α-SMA (Cell Signaling Technology, Danvers, MA, USA, 1:4000), 4-hydroxynonenal (4-HNE; R&D systems, Minneapolis, MN, USA, 0.5 µg/ml), lamin B (Abcam, Cambridge, MA, USA, 1:10,000), and β-actin (Santa Cruz Biotechnology, Santa Cruz, CA, USA, 1:200) overnight at 4 °C. The membrane was then incubated with the relative secondary antibody (Santa Cruz Biotechnology, Santa Cruz, CA, USA). Detection was performed using the ECL chemiluminescence (Santa Cruz Biotechnology, Santa Cruz, CA, USA) according to the manufacturer’s instructions. Luminescent signal was recorded and quantified with the Syngene G box (Syngene, Cambridge, UK). Data were expressed as mean ± SEM. The significance of differences was determined by one-way ANOVA followed by Duncan’s test for multiple comparisons using an SPSS (20.0 K for Windows). A probability level of P < 0.05 was considered statistically significant. Functional ingredients of MLE were analyzed by HPLC. HPLC analysis of the standard MLE showed that the retention times of DNJ and resveratrol were 1.855 and 17.512 min, respectively. The MLE contained the presence of DNJ (3.75 %) and resveratrol (0.015 %) (Fig. 1). After 9 weeks of dietary manipulation to induce obesity, the HF group showed a significantly higher body weight compared to the CON group. MLE did not affect body weight after 12 weeks of treatment (Table 2). WAT accumulation, including epididymal and retroperitoneal fat, was slightly decreased in the L group (low dose of MLE-treated group) compared to the HF group. However, body fat mass was not significantly different among the HFD-fed groups regardless of MLE supplementation (Table 2). Triglyceride (TG) and total cholesterol (TC) levels in the HF group were significantly increased compared to those in the CON group. However, TG and TC levels in the MLE-supplemented groups were significantly lower than those in the HF group (Table 3). HDL-cholesterol levels were also significantly higher in the MLE-supplemented groups compared to the HF group. Moreover, LDL-cholesterol levels and the atherogenic index (AI) in the HF group were significantly higher than those in other groups (Table 3). To investigate the effect of MLE on hepatic function, GOT and GPT activities were examined in plasma. The results showed that the activities of GOT and GPT in the MLE-treated groups were significantly lower than those in the HF group (Table 3). Hepatic histology showed the increases in fat deposition in the HF group as compared to those in the MLE-supplemented groups. The MLE-supplemented groups (the L and H groups) showed significant decreases in fat accumulation compared to the HF group (Fig. 2). The mRNA levels of LPL, SREBP1c, and aP2 in the all MLE treatment groups were significantly lower than those in the HF group. Furthermore, the mRNA levels of transcription factors such as LXRα, FAS, and C/EBPα in only the H group were significantly lower compared to the HF group (Fig. 3a). Similarly, protein levels of SREBP1c, C/EBPα, LPL, and FAS in HF group were higher than those in the CON group. The H group showed lower protein levels of LPL and SREBP1c than the HF group (Fig. 3d). Gene expressions of energy metabolism-related genes including UCP2 and PPARα were also determined. As shown in Fig. 3b, up-regulation of UCP2 gene expression in the MLE treatment groups was higher than that in the HF group. Furthermore, gene expression of PPARα in the H mice was similar to that in the CON group. Protein level of PPARα in the HF group was lower than that in the CON group, but there were no significant differences among the HF and the MLE treatment groups (Fig. 3d). Alpha-SMA and collagen are makers of liver fibrosis. As shown in Fig. 3c, mRNA levels of α-SMA and collagen in the HF mice were increased in the HF group. MLE treatment, especially at high dose, significantly inhibited up-regulation of the collagen and α-SMA gene expression in the HF group. Protein levels of α-SMA were similar to results of α-SMA. The protein level of α-SMA in the HF group was significantly higher than that in the CON group, but all the MLE-treated groups showed lower levels of α-SMA compared to the HF group (Fig. 3d). 4-Hydroxynonenal (4-HNE) protein adducts levels were measured in both plasma and liver (Fig. 4a). Plasma and liver 4-HNE were significantly higher in the HF group compared to those in the CON group. Both plasma and liver levels of 4-HNE in the H group were significantly lower than those of the HF group, whereas only plasma 4-HNE level was lower in L group compared to HF group (Fig. 4a). 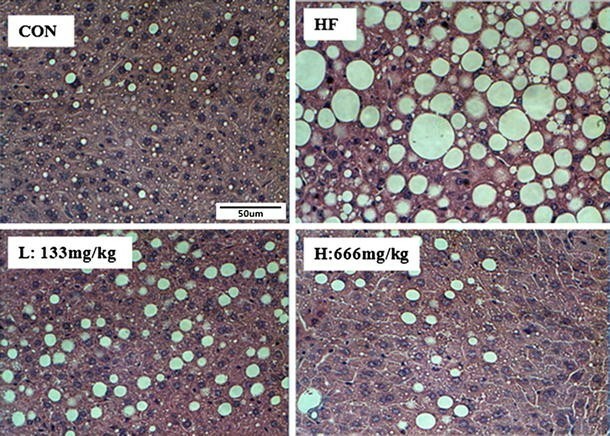 The activities of, the defensive enzymes, HO-1 and GPx in both plasma and liver were investigated to elucidate mechanism in which MLE supplementation regulates hepatic antioxidant defense system in HFD-induced obesity (Fig. 4b, c). Plasma and liver HO-1 and GPx activities were higher in the HF group than those in the CON group. The activities of HO-1 and GPx in H group were significantly lower than those in HF group in both plasma and liver as well as those in L group only in plasma. The nuclear level of Nrf2 was higher in the HF group compared to that in the CON group, but was lower in the H group (Fig. 4d). The present study provides the evidences that MLE can induce cellular antioxidant defense system and examines hepatic lipogenesis, lipolysis, and fibrosis in HFD-induced non-alcoholic fatty liver disease (NAFLD). In this study, MLE showed its beneficial effect on regulation of lipid profiles and the atherogenic index, accompanied with the inhibition of fat accumulation in the liver. MLE protected liver damage against HFD-induced NAFLD demonstrated by hepatic function test (GOT and GPT levels). MLE showed decreases in the hepatic expressions of lipogenesis genes, including LXRα, LPL, SREBP1c, FAS, C/EBPα, and aP2 but increases in the expressions of UCP2 and PPARα genes. Moreover, MLE reduced hepatic fibrosis demonstrated by gene expressions of α-SMA and collagen. Furthermore, MLE treatment ameliorated oxidative stress as well as abnormal metabolic dysregulation in HFD-induced obesity. Mulberry leaf possesses a strong antioxidative (Aramwit et al. 2013) and anti-obesity effects (Peng et al. 2011). In our previous study, mulberry leaf has shown anti-inflammation and antioxidant effects on obesity (Lim et al. 2013b). Earlier studies suggest some potential effects of the mulberry leaf on regulation of the antioxidant defense system and dyslipidemia in vivo and in vitro (Kobayashi et al. 2010; Liu et al. 2008; Peng et al. 2011). In addition, mulberry leaf has several effects such as scavenging free radicals, inhibiting oxidation, and reducing atherogenic risk (Liu et al. 2008). The current study showed that MLE contains several important polyphenolic compounds including DNJ-1 and resveratrol. According to the HPLC analysis results previously reported, the total DNJ content was approximately 4.99 mg/ml in low MLE (L) and 24.98 mg/ml in high MLE (H) (Lim et al. 2013a). In addition, resveratrol was determined as about 0.02 mg/ml (L) and 0.1 mg/ml (H) in the MLE. These natural compounds were shown to exert anti-obesity effects by inhibiting differentiation of preadipocytes (Rayalam et al. 2008) and stimulating β-oxidation system (Tsuduki et al. 2009). Previous studies proved that DNJ-rich MLE has been potentially used to improve lipid profiles in a human study (Doi et al. 2000) and to suppress lipid accumulation through activation of the β-oxidation in vivo (Tsuduki et al. 2009). In addition, resveratrol has properties to decrease ROS (Liu et al. 2012) and stimulate PPARα involved in fatty acid oxidation (Nakata et al. 2012). Moreover, previous studies reported that resveratrol improved insulin resistance by promoting HO-1 protein through mediating Nrf2 level in HepG2 cell (Cheng et al. 2012). The increases in plasma lipids and body weight are considered to be associated with obesity and its related diseases, such as NAFLD and dyslipidemia. Although oral administration of MLE did not affect body weight and body fat mass in obese mice, it significantly reduced plasma levels of TG, total cholesterol, HDL-cholesterol, and LDL-cholesterol as well as the atherogenic index (AI). Moreover, MLE treatment considerably attenuated the HFD-induced hepatic lipid accumulation and hepatic function. Hepatic lipid accumulation has been known to be caused by stimulation of LXRα-dependent lipogenesis and reduction in lipid catabolism, such as lipolysis and β-oxidation. LXRα expression regulates lipogenesis, synthesis, and uptake of cholesterol, fatty acids, TG, and phospholipids directly or via activation of SREBP1c. SREBP1c is a well-known transcription factor that regulates gene expression of the adipogenic genes, C/EBPα, and aP2 in the liver (Hasty et al. 2000). In addition, this pathway stimulates adipogenic signaling such as gene expression of C/EBPα and aP2. Furthermore, SREBP1c regulates gene expressions of FAS and LPL, which lead to the enhancement of fatty acid synthesis and accumulation of TG. In this study, MLE dose-dependently ameliorated gene expressions of LXRα, LPL, SREBP1c, FAS, C/EBPα, and aP2 and protein levels of nuclear SREBP1c and cytosolic LPL. A previous study demonstrated that Nrf2 activation inhibited up-regulated LXRα activity and LXRα-dependent liver steatosis (Lee et al. 2006). Collectively, the results of the current study suggest that MLE attenuates lipid accumulation through the decrease in LXRα-dependent lipogenesis and the increase in lipolysis in HFD-induced NAFLD. Another mechanism to regulate hepatic lipid accumulation is the induction of gene expression related to energy expenditure and β-oxidation via promoting lipid degradation and energy metabolism. PPARs are the family of ligand-activated transcription factors. PPARα regulates lipoprotein metabolism, stimulates hepatic uptake, and increases the esterification of fatty acids (Fruchart et al. 1999; Muoio et al. 2002). In addition, PPARα stimulates fatty acid uptake and oxidation in mitochondria. A previous study proved that decreases in mitochondrial fatty acid oxidation and energy expenditure stimulated excessive accumulation of TG in the liver (Kobayashi et al. 2010). The activation of PPARα regulates lipoprotein metabolism, which enhances hepatic uptake and increases the esterification of free fatty acids (Fruchart and Duriez 2006) as well as activation of mitochondrial fatty acid oxidation. Kobayashi et al. (2010) confirmed that mulberry had regulatory effects on the PPAR-mediated pathway, PPARα, and/or PPARδ, which is involved in energy expenditure. Interestingly, a previous report suggested that supplementation with short-chain fatty acids (SCFA) reduced HFD-induced hepatic steatosis, but PPARγ deficiency blocked the ameliorating effect of SCFA supplementation on hepatic steatosis by regulation of UCP2 and AMP-activated protein kinase (den Besten et al. 2015). However, PPARα would be a main regulator among the PPAR families in MLE treatment according to DNA microarray experiment in HFD-fed mice (Kobayashi et al. 2010). The current study demonstrated that MLE induced up-regulation of gene expression and/or protein level of PPARα and UCP2 in liver. PPARα and UCP2 are associated with lipid homeostasis and energy expenditure by regulation of energy metabolism and mitochondrial β-oxidation (Rakhshandehroo et al. 2009). The results suggest that the MLE administration can alter energy metabolism and mitochondrial β-oxidation of long-chain fatty acids via regulation of PPARα and UCP2. Hepatic fibrosis is a wound healing process for chronic liver injury. In response to oxidative stress, hepatic stellate cells (HSCs) transform into proliferative, fibrogenic, pro-inflammatory, and contractile myofibroblasts, which express α-smooth muscle actin (α-SMA) and type 1 collagen (Huang et al. 2004; Lee et al. 2001). Park et al. (2011) reported that the HFD-fed mice were characterized by increases in gene expressions of the hepatic fibrosis markers such as α-SMA and collagen. Numerous studies have demonstrated that adipocyte differentiation and oxidative stress induced hepatic fibrosis and development of NAFLD (Huang et al. 2004; Kim et al. 2012; Lee et al. 2001). The current study could give a clue for a beneficial effect of MLE supplementation on hepatic fibrosis by decreases in α-SMA and collagen gene expression as well as α-SMA protein in the HFD-induced NAFLD. Oxidative stress represents an imbalance between the production of reactive oxygen species (ROS) and a biological system’s ability to readily detoxify the reactive intermediates or to repair the resulting damage (Sinha et al. 2013). Recent studies have suggested that the HFD-induced obesity triggered an increase in ROS production in the body (Freeman et al. 2013), which might be associated with increases in oxidative stress-associated enzymes such as HO-1 in NAFLD (Roth et al. 2012). Over-production of ROS in obesity can easily induce metabolic dysfunctions and its related diseases such as type 2 diabetes and cardiovascular diseases. In addition, ROS are thought to be responsible for the progressive replacement of the normal hepatic structure with scar tissues (Wang et al. 2013). Recent studies found that oxidative stress-associated levels are correlated with NAFLD, as shown in clinical studies and histological findings in vivo (Koruk et al. 2004). Nrf2 is one of the transcription factors known to play a key role in cellular redox homeostasis (Freeman et al. 2013). Nrf2 regulates production of antioxidant enzymes such as HO-1, catalase, superoxide dismutase (SOD), and glutathione peroxidase (GPx) (Kobayashi et al. 2006). Thus, Nrf2 and its downstream are very important to protect cells from oxidative stress. Previous studies demonstrated that Nrf2 inhibited onset and progression of NAFLD caused by HFD by activation of cellular antioxidant defense system (Okada et al. 2013). Moreover, Nrf2 showed great ability in the regulation of lipogenesis, lipolysis (Xue et al. 2013), and fibrosis (Shimozono et al. 2013) in NAFLD. However, the role of Nrf2 is still controversial due to undesirable sides of Nrf2 (Chen et al. 2014; Kannan et al. 2013; Rajasekaran et al. 2011; Xu et al. 2012; Zhang et al. 2012). Xu et al. (2012) reported that enhanced activity of Nrf2 aggravated not only insulin resistance and lipid accumulation in adipose tissue, but also hepatic steatosis in leptin-deficient mice. Other previous studies documented that Nrf2 deficiency ameliorates glucose tolerance in HFD-induced obese mice (Zhang et al. 2012) and prevents hypertrophic cardiomyopathy induced by reductive stress (Kannan et al. 2013; Rajasekaran et al. 2011). Therefore, over-production of Nrf2 might result in paradoxical effects by disturbing protection of cells from oxidative damage under different disease stages (Pi et al. 2010). In other words, balanced level of Nrf2 is very important for disease prevention as well as improvement. Aforementioned chronic oxidative stress induced by long-term intake of HFD could cause Nrf2 translocation by separating Nrf2 from its repressive protein Kelch-like ECH-associated protein-1 (Keap1) in cytoplasm (Chen et al. 2014). Indeed we found imbalanced nuclear Nrf2 activation as well as increases in 4-HNE protein adducts in hepatic tissue of the HF group compared to those in the CON group. At the same time, the HF group showed higher levels of Nrf2-involved antioxidant enzymes including HO-1 and GPx both in plasma and in liver. However, MLE reduced oxidative stress represented by 4-HNE both in plasma and liver. Consequently, MLE supplementation normalized nuclear Nrf2 activation and activities of HO-1 and GPx in plasma and liver. The results suggest that HFD-induced excessive oxidative stress results in imbalanced cellular redox status followed by the increase in Nrf2 activation, but MLE supplementation normalized redox status and antioxidant enzymes under obese condition systemically along with regulation of Nrf2 activation. Furthermore, this result showed that oxidative stress-related markers including HO-1, GPx, and 4-HNE showed consistent tendency in plasma and liver, respectively. Oxidative stress markers such as 4-HNE and HO-1 in liver were much higher in all groups compared to those in plasma. This might indicate that liver is one of the main target tissues with abnormal lipid accumulation in HFD-induced obesity and has more chances to expose to oxidative stress. In conclusion, MLE inhibited obesity-induced NAFLD progression via reduction in hepatic lipogenesis, fibrosis, and promotion of lipolysis in HFD-induced obesity. Furthermore, MLE normalized oxidative stress and Nrf2-regulating antioxidant defense system which would be an important mechanism for prevention and/or treatment of obesity-induced NAFLD. The current findings could provide an insight into the development of strategies to prevent and treat obesity-induced NAFLD in the future. This research was supported by National Research Foundation of Korea Grant funded by Korean Government (NRF-2010-0006624, NRF-2012R1A1A2040217). J. Y. Ann, H. Eo and Y. Lim declare that they have no conflict of interest.